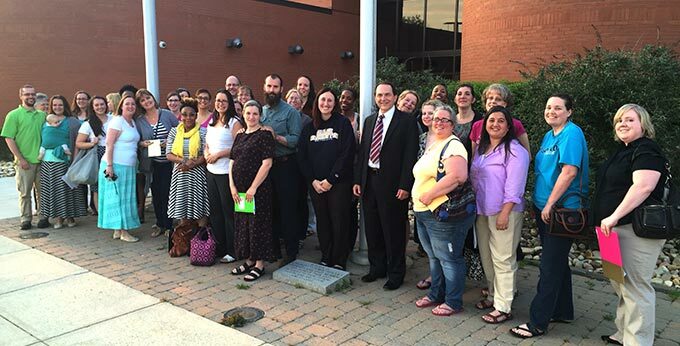 HSLDA Senior Counsel Scott Woodruff and dozens of homeschool parents attend a school board meeting in Charles County, Maryland, to protest the way they have been treated during recent portfolio reviews. With the room packed with homeschoolers, last night 12 of these parents stood up before the Charles County School Board and voiced their disappointment and frustration with the shabby, disrespectful, paternalistic, wildly inconsistent treatment they have received in connection with portfolio reviews this year. I was there to observe, and represent the HSLDA legal team, along with my assistant Landon Farmer. The school board seemed genuinely taken by surprise. The staff’s initial response was to explain that this year they changed from a system where one or two well-experienced people did all the reviews to a system where volunteers from the central school office did the reviews. It was clear from the testimony that these volunteers knew virtually nothing about homeschooling, homeschool culture, homeschool teaching methods, and the importance of respecting homeschool freedom. They often treated homeschool parents like misbehaving children. They failed to grasp that their purpose was not to evaluate a homeschool program, but merely to view sample materials to verify that regular, thorough instruction had taken place. Janet B., who had previously been through 20 portfolio reviews, expressed her shock and disappointment at recent treatment. Lisa G. said it was clear the volunteers had no training and mentioned that some counties use homeschool parents to conduct reviews. Michelle T. related that some people were left in tears after harsh treatment by reviewers. Sarah M. spoke of receiving a letter threatening that the state’s attorney might be contacting her. Near the end of the hour, Amy Hollstein, Assistant Superintendent of Instruction, stood up, apologized, and offered to set up a committee composed jointly of homeschool parents and school staff to review the situation and recommend policy changes. She also said she would immediately give revised instructions to all reviewers. Immediately after the meeting, I met with the homeschool parents outside the board room. Many were concerned about how they would be treated for reviews that are coming up very shortly. I urged them to call Amy Hollstein if their reviewer was in any way disrespectful or unreasonable. Her number is (301) 934-7377. The joint committee is an opportunity for the school board to set things right. We will continue to follow this situation closely.